WW1 Reenactments Equipment : Great War Tommy WW1 Documents, Paperwork : Facsimile Newspaper- Great Britain At War 1914. WW1 Reproductions and WW1 Reenactors Equipment / Kit - Facsimile Newspaper- Great Britain At War 1914. Facsimile Newspaper- "Great Britain At War" 1914. 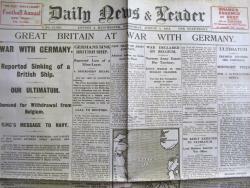 Full size,(22" x 162") 8-page facsimile of The Daily News, August 5th, 1914, "Great Britain at War". Includes an interesting full page ad' by the Neutrality League.